The Unexpected Perks of Ranking 1st on Yahoo! I'm going to detail an interesting turn of events for one of my personal sites. I'm hoping it sheds some light on how Yahoo! influences their search traffic numbers. 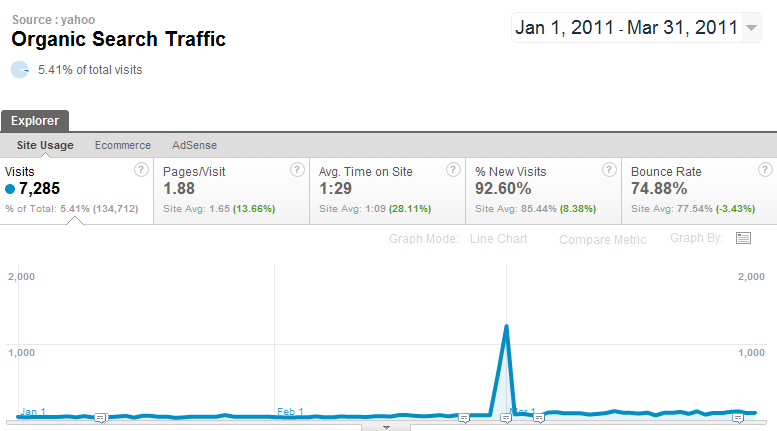 While looking through Google Analytics I noticed a nice little peak in search traffic. Hmm, nice... but why so temporary? Also, I'd love to say that the general "up and to the right-edness" of the graph is a direct result of my super-awesome web marketing ability, but seasonality is a big part of it as well. Outside of the organic traffic report this sort of thing is commonplace. That could easily be a single page that got hot on Twitter or Stumbleupon, referral traffic from a popular blog, or the day of an email campaign. Within the organic traffic report, this definitely requires some investigation. From the center slider of the Yahoo.com homepage. Culprit highlighted. At this very moment there are 32 slides, 5 of which include a link directly to a search engine result page. The image above leads to a Yahoo! 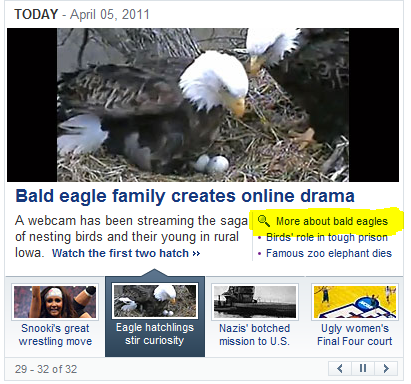 search for "bald eagles". 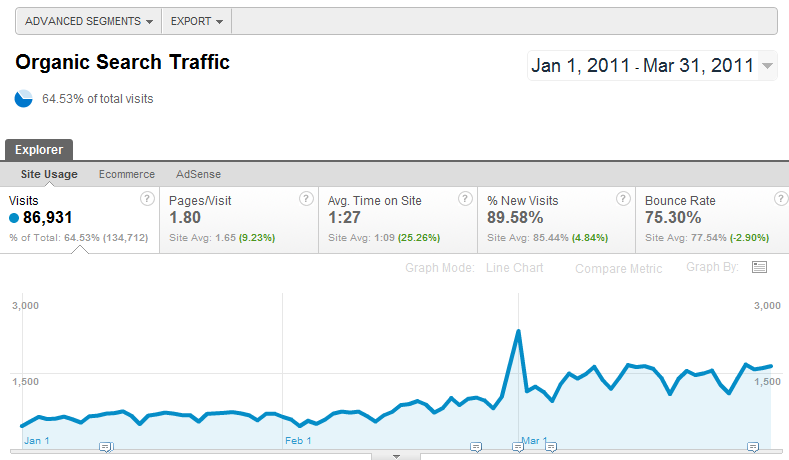 By my estimation this slider sent roughly 1,700 visits to my site during the 48 hours it was on the homepage. Considering users aren't actually searching for this keyword, let's assume 20% of users clicked the first result. That means around 8,500 "searches" were done for this keyword as a result of the slider. 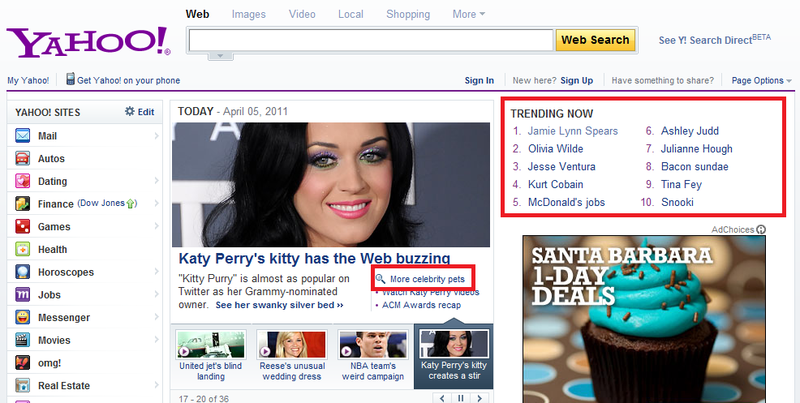 Multiplied times the 4 other click-searches from the slider, then dividing by 2 for one day's worth of traffic, Yahoo! is creating search volume of 21,250 from the slider per day. Couple this with the tons of other click-searches throughout Yahoo! 's properties and it might become more clear how they've been able to maintain 16% of the market share. Highlighted are click-searches from the homepage. If that 1 slider link, which is displayed for a total of 10 seconds before it has to wait another 310 seconds to show up again, leads to almost 10,000 searches per day, you can bet the static trending topics list sends an exponentially greater number. Danny: So now you’re reporting the true searches? Cameron: We are not redefining what counts in Core Search. Instead, we’re classifying contextually-driven search as a different type of search and allowing the end users of our data to decide if or when to include them in their analysis. The best example of Yahoo! 's contextually-driven searches are their slideshows (example). Notice how the block of "Related Search Results" refreshes on each new photo. In the past, each photo swap was a new "search", but is no longer included in the "Explicit Core Search" figures. 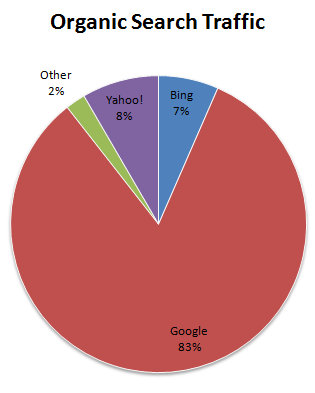 Good for ComScore, this is clearly not something that should be figured into search market share numbers.